Ezy Slim is a wonderful combination of eleven herbs which act collectively to give slim & fit body with improved digestive system. Ezy Slim reduces excessive appetite for food and removes excess fat from the areas which are prone to fat deposition like face, neck, waist, abdomen, buttocks & legs and that too without fluid loss and weight regain. 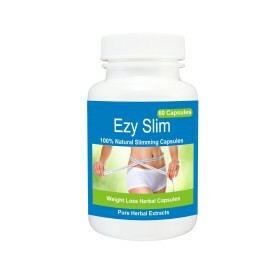 Ezy Slim is formulated to give you the desired weight within a short time without the effort of tiresome exercises. Ezy Slim is a blend of herbs which regulate the body metabolism to reduce fat deposition and improves digestive system. It is very useful in controlling Obesity, Hyperlipidemia and craving for food. Ezy Slim improves body systems to maintain its biological activities, metabolic activities and hormonal balance. It improves metabolic functions, basal metabolic rate, reduces appetite, reduces fat and converts of glucose to glycogens. Ezy Slim increases body cell metabolism which breaks fat into its metabolites. It inhibits synthesis of fat from sugars and converts sugar to glycogen. This combination suppresses the appetite and provides nourishment to body. Lowers the harmful cholesterol Low Density Lipids LDL by improving High Density Lipids (HDL).